I was born in 1980 in Turku, Finland. My family moved to Sweden before I turned two, and I lived there until I was 19, when I moved to Norway for reasons of love. I will start my space science education at university level in July 2001: three-year education, to which I may add one year of reading additional science courses. My Apollo interest came when I was 17, the Internet opened itself to me; and, since I was interested in space travel, I started browsing pictures at various NASA galleries. Apollo caught my interest because it was as far out as man had got. It really fascinated me. Then I saw 'From The Earth To The Moon' when I was 19, episode 7, and Pete Conrad's first words on the moon caught me, and I had to know if it was for real, or if it was just humour added for the TV series. That's how I found the ALSJ, to this date the best Apollo site around. Here is a picture of me when I was young. 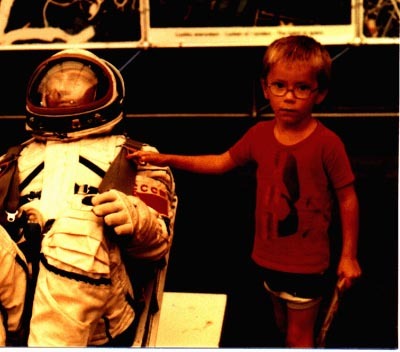 My family was at a space museum - which I have no memory of, sadly - but I hear I enjoyed it!